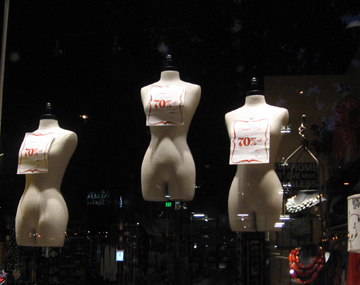 I opened a new online photo gallery, The Urban Landscape, in order to share pictures I capture as I walk through life. You may visit the gallery by clicking HERE. In her article in the June 1, Washington Post, Why I Watched a Snake-Handling Pastor Die for his Faith, photographer Lauren Pond wrestles with the ethics of press photographers who document life’s tragedies with pictures, all the while standing by and not taking action to intervene in the situation as it unfolds. Pond contrasts her decision not to call paramedics to the scene as Pastor Randy “Mack” Wolford lay dying from the venom of the snake that had bitten him and the strychnine he had ingested as part of a religious ritual with the actions of Pulitzer Prize winning photographer, Kevin Carter, who was roundly criticized for photographing an emaciated Sudanese child who, under the watchful eye of a vulture standing nearby, struggling to reach a food center during a famine. Carter later committed suicide. I highly commend Pond’s Article, in which she writes about her soul searching as she tries to come to grips with her decision. 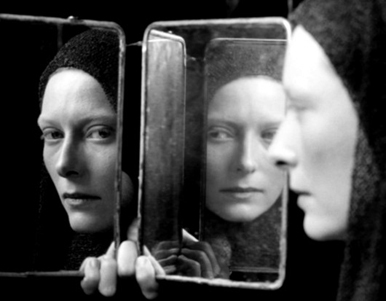 I just came across a portrait of Tilda Swinton by Fabio Lovino, reproduced below. This picture reminds me of my own photograph which I call On the Dressing Table. I have been shooting lately with a Zorki 4 with f1.5 50mm Jupiter 3 lens, and a Fed 2 with Industar 61 lens. Both of these are Former Soviet Union (FSU) Leica copies. They are 50 year old rangefinder cameras, however, you could not tell how old they are by looking at them, and they operate like they are new cameras. 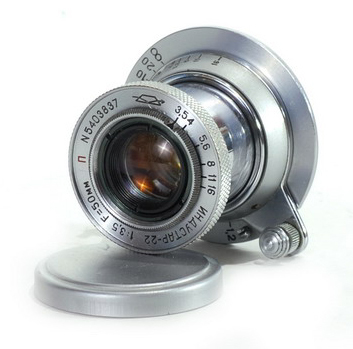 My favorite seller of FSU cameras is the ebay seller, Synoptics Camera Store. This vendor services these old cameras before selling them so they perform as if they are brand new. And often they will sell items that look new too. 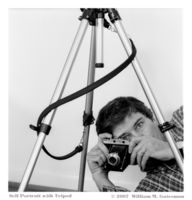 The cameras are dirt cheap too — they cost about five percent or less of what one would pay for a comparable Leica, and the ones I have purchased are fine photographic machines. I have been lamenting that the cameras with fixed lens do not fit as easily into my cargo pants pockets as I would like, so I decided to purchase a collapsible lens — that is a lens that pushes into the camera body when not in use. The lens I picked up from the Synoptics Camera Store last week is pictured above. Now I will just have to wait a few weeks for it to be shipped to me from Kharkov, Ukraine. I highly recommend the Synoptics Camera Store. For the photographic artist, this constructive processing must inform the editing process as one reviews the various images captured in camera. By that measure, both Pete Plays the Blues, and the photo, On the Dressing Table, which is set forth above, might be said to have gone beyond the mere repetition of nature. In each case, upon first showing these photos to a friend and critic, he responded with protest. Indeed, it was not until I wrote this essay that that I recognized the significance of this unmanipulated photograph, which like the cubist paintings about which Rozanova wrote, shows my subject from multiple points of view all in the same frame. Another image in which the resulting picture differs substantially from the subject I saw in my camera’s viewfinder is Boys at Play, reproduced below. The photograph above, Maritime Abstraction, and other photographs that I hope are more than mere plagiarisms of nature, are shown in my online photo gallery at www.wmgphoto.com. Olga Rozanova’s essay is reproduced in the book Art in Theory, 1900 — 2000, An Anthology of Changing Ideas, by Charles Harrison and Paul Wood.